Hnaui, eri hnauiri, et augi annim, agnoi etri telaith. anaugeit innath, ne caran apsa auruth. [Listen, you hearers, and those with eyes, look upon me. cruelly they come, crooked beings. breaks bright on the walls. and, for the high-towered city, hope. Se Narsaugir survives in the unique manuscript Seador, Liant Universat MS A179, known more commonly as the Liant Codex. It is written in standard Skani alliterative verse, with first and last words in either lines or clauses alliterating (but note the irregularities at ll. 4 and 15), and occasional end rhyme as embellishment (see Corfu 1102 for versification). The script is a remarkable example of Lantean-influenced Skani minuscule, somewhat further along in Skani's progression to Skano-Lantean than other examples, such as the Skani Wraithsaga and other early post-Schism documents (see Macara 1106 for palaeographic discussion). Its editorial title, assigned by its first editor Kinsan Archivist (799), comes from the one proper name (other than that of the Wraith and Atlantis) which appears in the remaining text. Kinsan Archivist's philological and etymological work revealed that the name literally means "one who keeps watch over what is beloved" (narsa, "rich, precious, dear" + augir, from augen, "to watch"). Narsaugir still exists in the form Narsaui in Skani dialect, and is continuously attested throughout Skani linguistic history. According to Skani oral histories (see Zenai Archivist, C0u-8F), Narsaugir is the nearest Skani translation of Archae-Lantean pastor, glossed in Anglo-Lantean as shepherd (Corbel Glosses N67) and transliterated into Skani as Sefard. This, combined with the honorific [i]serni, "city lord," identifies the subject as John Sheppard the First, and the action of the poem as the first battle against the Wraith after the Secession. The folio on which the poem is contained (4v) is damaged, with two lines of text effaced beyond reconstruction. Iletor Ganides has proposed readings for these lines (Ganides 1081), but these remain highly conjectural and unsatisfactory. Nonetheless, our knowledge of the events of the first battle gives us the facts of the material lost in the lacunae; the otherwise cursory Ystoria Lantica preserves a remarkably full account of the battle, in which "at the bidding of John Sheppard, many-towered Atlantis shook free of her moorings and winged skyward, pursuing the Wraith first with ydrons and then with a great pillar of light which emanated from her heart and obliterated her enemies" (YL 2.16). The poem's delineation of the battle scene, limiting itself to describing the approaching Wraith, the city in flight and soerni-Sheppard's use of the city's great weapon, and presenting the first seven lines in the present tense, is perhaps the paradigmatic example of Skani narrative economy, and only heightens its closing emphasis on what soerni-Sheppard and those with him brought to Pegasus (with Atlantis as metonym): the peace and freedom from the Wraith which even now, over a thousand years after the iredan weia lakteia, we honor and remember. Considering the preciseness of the poem's details, the poet likely had available either an eyewitness (the otherwise unknown Innath) or a copy of oral or written testimony. At least the latter would have been accessible to her; the Ystoria mentions the "many songs" made in the first days after the Terran Schism, and all modern Pegasan histories begin their dates from that point, attesting to the significance the event had for the galaxy as a whole. The incipit, an exhortation for "you hearers" to hear the speaker can be taken as either a vestige of original oral performance (and possibly of a long history of oral tradition; see Narenus 1098) or as a self-conscious archaism--which is, as I have noted elsewhere, incongruous with the colophon's insistence that this is a poem which records in writing the testimony of a putative eyewitness (Macara 1111). Surviving documents record Auruth as a Skani female given name; however, none of the five instances recorded appear to be the names of women associated with scribal or recording guilds (Janap Archivist, A4k-1A). Of the five, the Early Lantean Registers list two as weavers licensed to work in the Lantean marketplace, while "Inskar Auruth" appears in the marriage banns for the year 191 AS as the wife of the Lantean scientist Arin Selenk, the great-grandson of Radek Zelenka (Janap Archivist, B2i-8C; see also the Genealogia Selincidae, Janap Archivist, C8p-1W). Of the two remaining, the "Benar Auruth" on a 5 AS passenger manifest of the Porsche, a ship known to be contemporary with the first years after the Secession, is the better candidate for composing the poem (Idemon Archivist, personal communication), but nothing is known of her other than her contemporaneity with the events the poem describes. However, as I have argued elsewhere, the archaisms of the poem could well be a deliberate stylistic choice of a much later poet; a palaeographic and codicological examination suggests that Se Narsaugir was written no earlier than fifty years after the events it records, and was possibly composed at the death of John Sheppard as part of the Skaneir tribute to the great leader (Macara 1111). Its existence in manuscript, itself an archaic medium by this time (Lantean technology, including digital storage, had already begun to disseminate into Eskan by this point), further attests to deliberate archaism and the memorial significance the Skaneir accorded to "hard copy" textual forms. That this was considered a luxury item is evident in the decoration employed in the poem's opening initial, as well as the script and decoration of the other texts gathered with it, all of which are far more lavish than many of the other items in the Liant Codex, itself an ad hoc miscellany. The gathering containing Se Narsaugir includes five other items possibly related to it: a table from the Skani Computus, reworked to begin Skani history from the Terran Schism (ff. 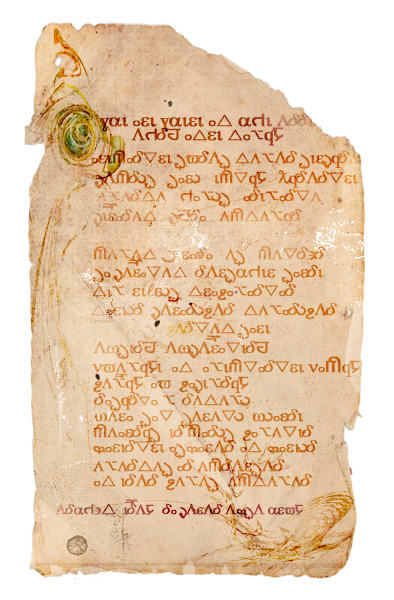 5r-8v); the De physica et multitudine temporis (On Physics and the Multiplicity of Time), a versification of McKayian physical principles (ff.8v-15r); a fragment of a Skani translation of the Athosian Chronicles (f. 15r); an Anglo-Lantean poem, with interlinear Skani glosses, ascribed to Iohannes Cash (f. 15v); and Pastor, redemptor noster, the earliest surviving piece of Neo-Lantean poetry known, with features that mark it as being of Skani composition (ff. 15v-16v). Raheli Amedes' still-definitive work on codices of Lantean provenance suggests that this particular gathering in the Liant Codex was originally not intended to be bound with it, but had originally been included in a much larger collection of Skaneir-copied texts, possibly intended for deposit in the Lantean archives as part of the Great Holding instituted by Teyla Emmagan shortly before her death (Amedes 1059). Further, the hand that wrote, or copied, Se Narsaugir was also likely responsible for at least the De physica and the Cash Poem, and provided the glosses to the latter as well, but cannot be attested elsewhere in the codex (Amedes 1066). Recently, Rijin Norek (1118) has reintroduced the argument that the poet responsible for Se Narsaugir also wrote the original portions of the compilation called Apsenden filiu Caiu, "The Words of [Rodney] McKay" (Haina, Haina Universat MS 890) but work done by Macara and Rodes demonstrates that the Apsenden are clearly a much later development, and grew out of native Skani-Lantean traditions and legends surrounding Amadnir McKay (Macara and Rodes 1115). Close textual analysis by Gorin Esagni suggest that at least some of the Apsenden could be considered contemporaneous with the Maker, but "no more than twenty percent, with no guarantee these were authored by him" with the rest forming "several layers of accretion over time" (Esagni 1108). Unfortunately, we cannot trace the Se Narsaugir poet outside of the one gathering contained in the Liant Codex; even the relationship of the Skani-produced materials to the rest of the codex continues to be problematic. It is likely, then, that Se Narsaugir, like its companions in the Liant Codex, will remain as much a source of mystery as it is of enlightenment to scholars seeking to understand the literatures and histories circulating around the Great Secession and the Terran Schism that occurred immediately thereafter. For myself, I have found in all my work with this codex that the subjects of its poems and chronicles--John Sheppard, Rodney McKay, Teyla Emmagan, Ronon Dex, and all those who knew them--are both present to me, and yet at the same time they recede from me, so that I must wonder at how real they seem, but yet ghostly and insubstantial, ae seri mana deleith, "as if they had never been." Lux fiat pastore scienteque, et lux eorum vobis effulgeat. Author's notes: Skani, the language of the poem, is an actual constructed language I've been working on for some time and this is its first test (or text?)-drive. (It has a more or less functional grammar, so you could actually learn it if you had an Introduction to Skani book, or the .doc file on my computer. And if the vocabulary were larger... That's still under development.) The manuscript image was done in PS7, working off stock parchment/paper images and a sort of provisional alphabet that, if you squint, looks like Greek, Sanskrit, and a few other things. The impetus to commit this all to "manuscript" came from a conversation with sheafrotherdon, in which we were flailing helplessly over "Written by the Victors" and I mentioned that my favorite part of the piece was the end, the record of change and growth and the temporality it implies--and, more than that, the feeling that there's an actual archive somewhere, that I could go to and work in and learn from. That there isn't, of course, is deeply frustrating to me :> So as compensation, Cate convinced me first into writing the alliterative piece in English, and then started wondering what manuscript culture in Pegasus would be like, and that's how the Skani text and its manuscript came into being, along with the battery of commentary following it. My professional background is in the study of old literature and languages, and the commentary is more or less an echo of the kind of material I read for my work. Except, unfortunately, my poetry doesn't talk about John or Rodney :> But the poem, manuscript, and commentary were ways to try to touch the time cesperanza's story lays out--this huge, wonderful futurity and a past that is, in its own way, no less wonderful or mysterious, and I just love that.